Do Not use Actara, Assail, Belay or Admire, any generics or any combination containing them, if you have flowering weeds in your orchard. The presence of flowering weeds means that you will also have foraging bees present, and applying neonicotinoids when foraging bees are present is against the label. Some individual farms have populations above treatment thresholds. Any registered neonicotinoid insecticide (Actara, Assail, Belay, Admire Pro (IRAC 4A), or premixes – Leverage, Voliam-Flexi) will control these populations. Admire Pro will control aphids only. Closer (IRAC 4C) acts like a neonicotinoid, so it is very effective against aphids, but is bee safe. Beleaf (IRAC 9C) will also target aphids and control tarnished plant bug. Movento (IRAC 23) will control aphids and scale insects. Plum Curculio (PC): We are the peak of PC activity in all areas of the state. Moderate levels of injury were seen in both stone and pome fruit over the past week, even where effective insecticides were applied. If significant rains follow insecticide applications, then re-apply with effective materials after an inch or more of precipitation. Oriental Fruit Moth (OFM): All 1st generation eggs have been laid in southern counties, and the second application is due in northern counties. If your trap counts exceed 6-8 males per trap 7 to 10 days after the second spray, then additional controls may be required. 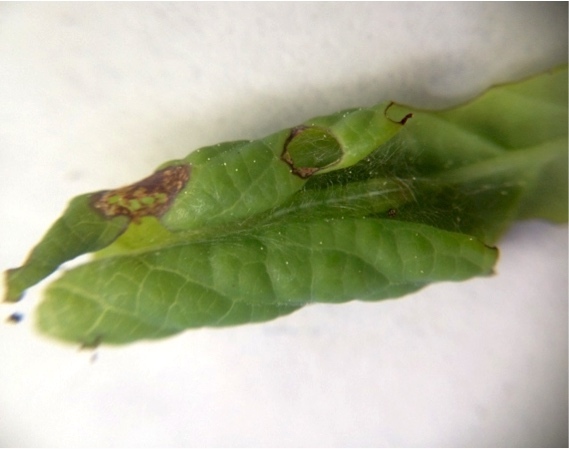 Growers who have had high OFM populations should be aware of the first trouble that can be seen in terminal flagging, or the drying up of tip growth as the larvae mine down the inside of the growing shoot (see photo). Tufted Apple Budmoth (TABM): The first tufted apple budmoth adults were caught on 5/12 in southern counties and on 5/17 in northern counties. The first insecticides that target this pest will be due at the end of the month in southern counties. This has been only a minor pest during the last 6-8 years. Rusty Spot: Current conditions are very favorable for rusty spot development. Early symptoms should be visible soon. Maintain control measures until about pit hardening. This is another area where having flowering weeds in your ground cover is a bad thing. Rally is used to control rusty spot, but if combined with a neonicotinoid insecticide for aphids or scale, you have a toxic combination for bees. If you have a weedy ground cover and use a neonic, then consider using one of the biorationals (Armicarb; Kaligreen; Serenade) in place of Rally to minimize impact on bees. 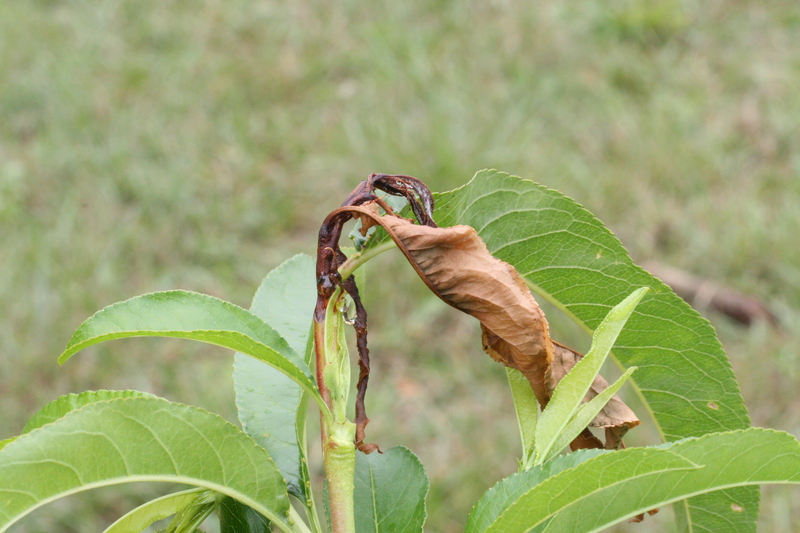 Peach Scab: It’s too early to see peach scab symptoms but it’s important to maintain control measures until about the middle of July, especially where scab was present last year. Plum Curculio (PC): As in peaches, PC is one of the main insect pests at this time. Avoid pyrethroid use at this time of year. They are not the most effective materials for PC, and kill mite predators and other beneficials as they are trying to build-up early in the season. Codling Moth (CM): The following chart updates timings for both southern and northern counties. Some farms in northern counties have extremely high pest pressure as measured by pheromone traps. Control of the first brood is critical, and every effort should be made to use the correct materials in a timely fashion. Apple Scab and Powdery Mildew: Scab symptoms are present in a few blocks in southern and northern counties. By the NEWA model, primary scab season should be almost finished. However NEWA models may not take into account dry weather. While we have had a few wetting periods that have discharged spores without sufficient leaf wetness for infection, dry weather may delay spore development. Therefore it would be conservative to continue protection for primary scab until early to mid–June. 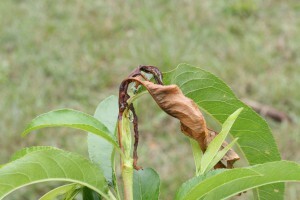 Fire Blight: Symptoms from the hot humid weather of a week ago are appearing in southern counties. So far only a few orchards with symptoms are being seen in southern counties. Control measures at this time are to continue strep applications where late blossoms are present combined with sanitation using ugly stub pruning. Do Not Apply strep in orchards with fire blight symptoms, or where bloom is not present. Pear Psylla: First generation adults are just beginning to appear on shoots and egg laying has begun in all counties. Eggs have also started to hatch in some locations. If you are planning to apply Movento, carefully monitor for eggs along the midribs of leaves near the tops of shoots. Bias sampling toward the tops of trees. Ideally, make the application before the most eggs hatch (see scouting calendar) since Movento needs about a week to become fully systemic. Other options for control include Centaur, Delegate, Agri-mek, Assail, Actara, Belay, Brigade/Bifenture, Calypso, Danitol, Decis; and the premixes – Endigo, Voliam Flexi and Voliam Xpress. The neonicotinoids: Assail, Actara, Belay and Calypso should not be used of flowering weeds are present and attracting bees. The pyrethroids (Brigade/Bifenture, Danitol, Decis, and Warrior) should be saved for summer sprays, as should Portal and Nexter. Follow the Agri-mek label instructions for adding adjuvants. The efficacy of neonicotinoids and Delegate can be improved by the addition of 1 qt. summer spray oil. Be careful when applying oil to Asian varieties. Plum Curculio (PC): We continued to find PC adults over the past week in both Burlington and Atlantic counties. Overall 9% of the sites sampled were positive for PC adults. The maximum count per site was 5 PC adults. This is traditionally the number one insect target requiring treatments as soon as the bees are removed. Once the bees are removed from the fields, consider PC effective materials like Avaunt, or Imidan. Leps. 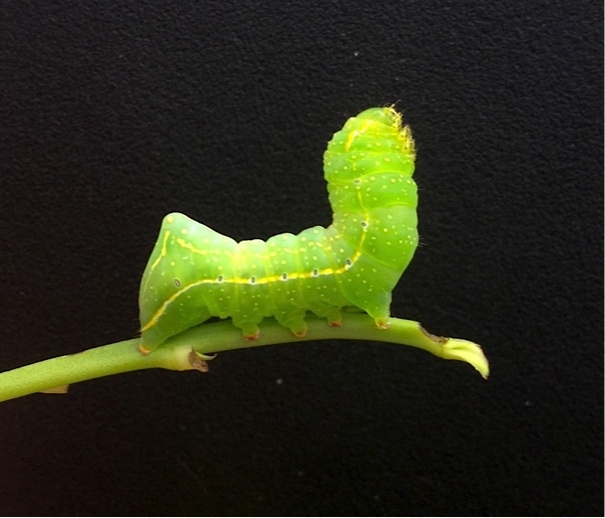 and other larva: Various leps including leaf roller larvae, humped green fruitworm, and eastern tent caterpillars are now present in the fields (Figures 1-3). A total of 14% of the sites sampled were positive for leps. 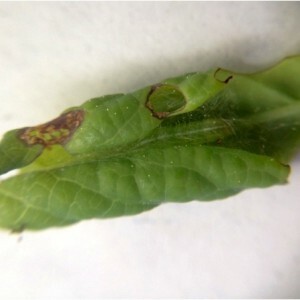 Leaf roller larvae are sampled for by observing the shoots and looking for leaves curled up (Figure 1). The maximum leaf roller larvae over the past week per field has increased to 3. 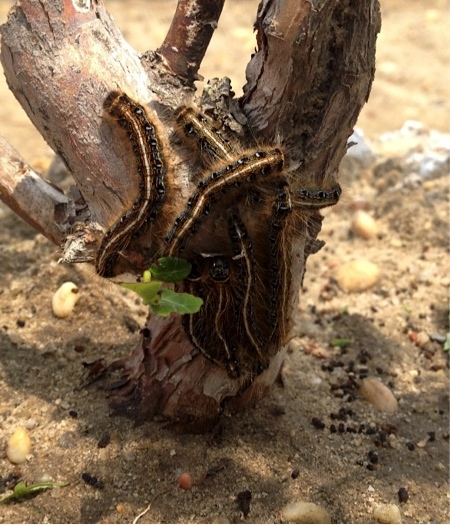 In addition, we continue to find eastern tent caterpillars in fields in Atlantic county. 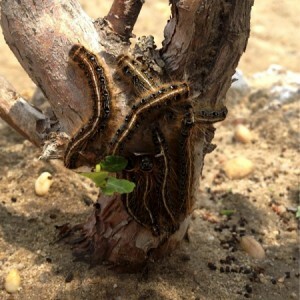 These caterpillars have made their way into the blueberry fields from surrounding infested trees, possibly carried by the wind. 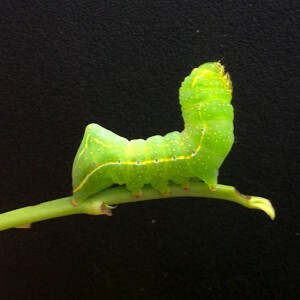 The caterpillars are present on the canes and in the foliage (Figure 2). In high numbers, there can be foliage damage. With bees in remaining in the fields treatment options are limited. Thrips: We began finding thrips in the field in Atlantic and Burlington counties on May 6th. Most farms do not have thrips activity. The maximum number of thrips was 89 thrips per 100 blossom clusters or 0.89 thrips per cluster. The threshold for thrips activity is 1 thrips per flower cluster. All sites with thrips activity are under the threshold level. Aphids: Shoots are being sampled for aphid presence. The first aphids were observed in the field on May 6th in Atlantic county. Aphids were found at 3 sites over the past week, but only a single aphid was observed per site. Cranberry Fruitworm (CBFW): Traps have been placed at multiple locations for CBFW adult activity. The first CBFW adult was found in a trap in Atlantic county on Monday May 11th. In the past, CBFW activity peaks at the end of May or beginning of June. 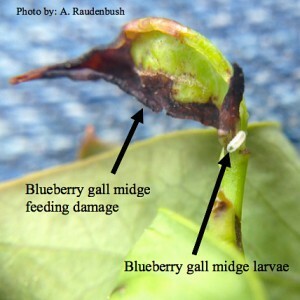 Blueberry Gall Midge: Blueberry gall midge were found in the Field Monday, May 18th. Adult blueberry gall midge are small flies that lay their eggs in the terminal growth of young shoots. Once hatched, the white larvae feed on the shoot tip (Figure 4), but this has never developed into an economic pest. Since the life cycle is fairly short, growers will see multiple generations of feeding evidence, but insecticides are not recommended.